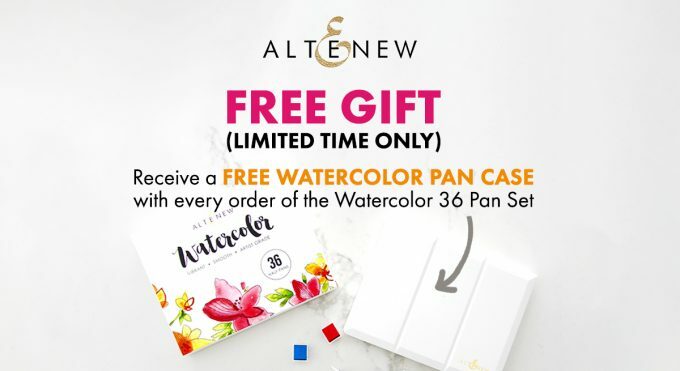 Hello and welcome to Altenew Watercolor 36 Pan Set Release Blog Hop! You probably came from Jennifer McGuire blog. 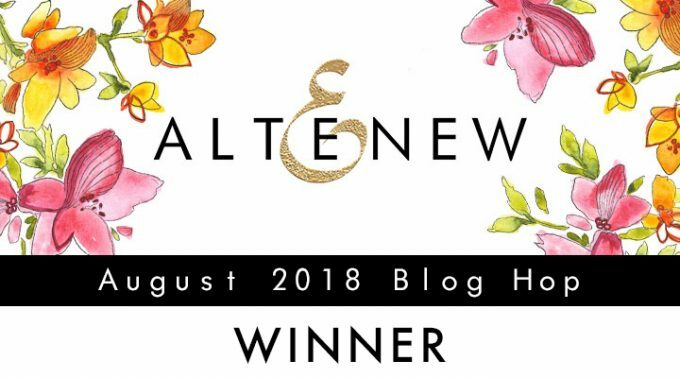 If not – you may consider starting from the beginning at Altenew blog and see what other members of Altenew design team and guest designers have created. There are so many beautiful projects from talented designers. Also you on each stop you you have a chance to win a prize. I made two cards for this release using wet on wet technique. I love working in this technique as it takes less time to make a project and the result is quite arty. For my first card I first stamped the design using Build-A-Flower: Cattleya and Evening Gray Dye Ink. The Cattleya design isn’t recognizable after my watercolor though 🙂 I used Lagoon and Dessert Night pads for the coloring. I mentioned that the technique I used is wet on wet, but I should rather say it was wen on very wet. As there was a lot of water. In this technique it’s quite hard to control the result, and that’s what I like the most about it. 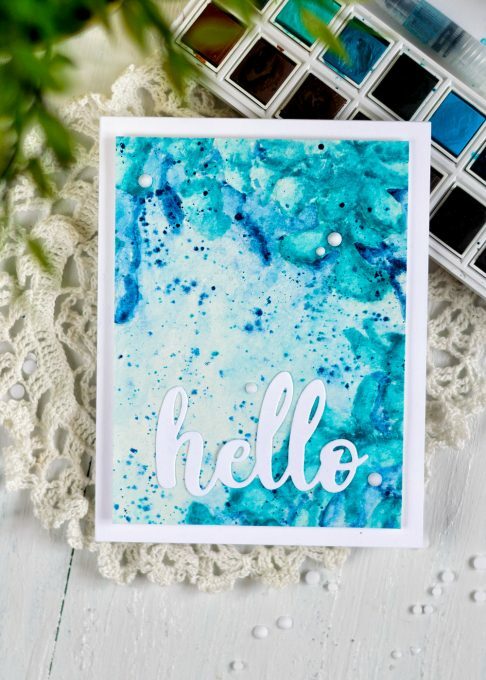 When I done with watercoloring I foam mounted the penal onto a white card base, adhered a word hello die cut using the Simply Hello Die and added several Snow Crystals. For my next card I used Build-A-Flower: Coral Charm and Remember This Stamp Set to white emboss the design. And then I watercolored it using wen on wet technique. Lastly I white embossed the sentiment onto a black cardstock and popped it up onto the card. Along with adding several Onyx Crystals. I will also randomly choose a winner from comments left on this post and the prize will be $30 gift certificate to Altenew online store. Please leave a comment on this post by 08/14/2018 at 11:59 PM EST for a chance to win. I will announce the winner here in this post on 08/15/2018. The winner of $30 Gift Certificate is lorraine turner. 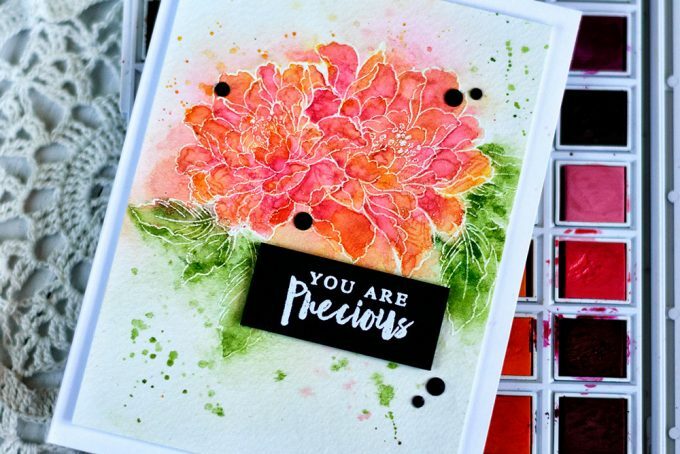 The watercolors make the stamps even more lovely and I love how it can add so much versatility to someone’s collection. Your projects are AWESOME! What a wonderful set of pan colors, I’d love to win! Gorgeous watercoloring, thanks for the video! I would love to win these wonderful colors! Your watercolor flowers are SO beautiful and bright! I love that terrific pop of color and the fresh design! Very pretty! These cards are stunning. I have to try both of these techniques of wet on wet and also embossing and then watercoloring inside. I keep seeing it but have never tried it. Love the cards!! Beautiful cards!! I love the blue background!! Simply gorgeous!! Great looking cards…like the colors that you from the watercolors pan…. Lovely backgrounds, want to give these watercolors a try! Absolutely love this! A watercolour set that is compact, easy to carry around, that co-ordinates with all my Altenew Inks. Love that the pans can be taken out so that individual colours can be replaced that are used more often. And the card inspiration is awesome! Especially your second card. 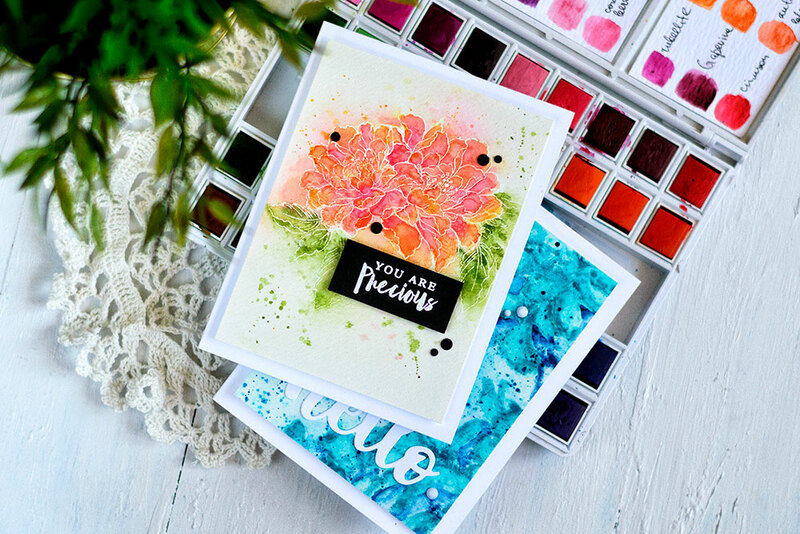 Just beautiful cards….I just love this new watercolor kit….great colors on your cards….vibrant and soft combined….love it..thank you so much. Both of your cards are beautifully watercolored. Well done. Beautiful cards! I love how you created the blue background, but I think my favorite is the one with the peachy/pink/orange flowers. Always love seeing your work! wonderful cards, Svitlana – especially love the second one!! Love the artsy look of your cards. This looks like a fun technique that I will need to try. What gorgeous cards those are and I can’t wait to see the video tonight! I’m intrigued that you say this is easy because they are too pretty to be simple! Really lovely! What a BEAUTIFUL blue background! And I love the detail and different shades on your flower! Your build a color coral charm card is simply divine! SO lovely and fresh. It really is a wonderful example of your awesome talent. Thanks for sharing your inspiration! Such pretty cards. Absolutely love the shading on the floral card! appreciate a more loosely watercolored look. Beautiful cards! Love your color choices! Lovely work . Colors are amazing. So many times I have embossed with black or gold powder when watercoloring. I really like your use of white powder. It is striking and the card is beautiful. It will be fun to play with these paints. Last – But definitely not least!! You have tickled my color bone! Out of this world beautiful! Love watercoloring. Love Altenew new watercolor set. Thanks for sharing your cards. Lovely. Both cards are very beautiful. What I love about watercolor is that you can use it the way you like. It can be very detailed and realistic or very loosely applied to create a suggestion of something. Thanks for your tips and I think I’m going to love these watercolors. Very pretty cards you made! 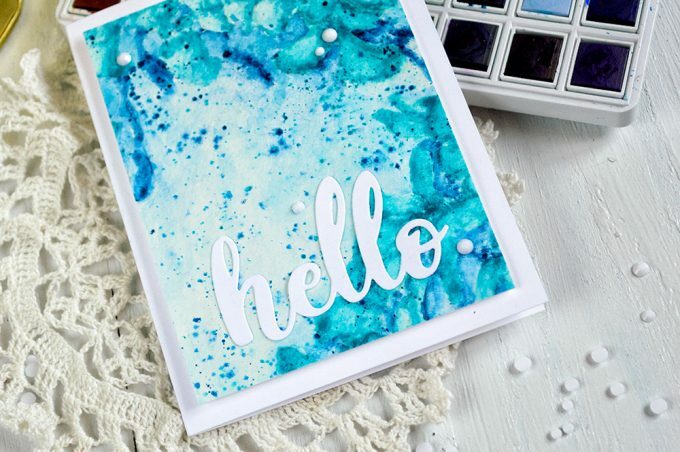 Pretty water color cards, love the soft blues with the white hello die and the coral and pink flower is stunning, your water coloring is amazing. Beautiful cards as always, Svitlana! I love spattery look! Love the blue background. Beautiful cards! I love the backgrounds you created, especially the blue one. I love the bright colors in this watercolor set! Thanks for the inspiration. Very lovely cards, and gorgeous flowers. Both of your cards are excellent. Great watercolor work. Beautiful cards! Those watercolours are just glorious! Give a wonderful finish! Stunning designs Svitlana! Love the bold colors of the first one and the subdued floral element on the second card. As always you did an amazing job! These colors are gorgeous and the case and brushes seem very practical, cannot wait to play with them!Thanks for all you share! Thanks for sharing your wonderful cards and inspiration with us, just loved reading your post! Great watercolour palette, these colours are so vibrant! Love both cards! they are beautiful. The first reminds me of looking through a window at flowers during a hard rain , and you can’t make out details! love it! Your flowers are so lovely but I’m particularly loving the backgrounds. Beautiful job! TFS! Nicely done on both cards. Beautiful cards! Can’t wait to try these out – the colors look so pigmented! Gorgeous cards! I love your colouring style! I am loving the bold pink/orange combination in the floral image, but the intensity of the blues on that card is simply amazing. There is a hint of flowers, but the overall effect is really neat. Thank you. Your cards are gorgeous! I think I am going to love these watercolors a lot! Thanks for the inspiration! I get lost in the many terms but at least you have fully explained this one, thanks. Very gorgeous effects from this one technique & quite different from each other. Very fluid & beautiful. Perfectly gorgeous cards! Stunning watercoloring and card designs. Fantastic! Beautiful! but saddly, I’m too early for the video but I’ll return later to see it, I can’t wait. Thanks for the inspiration! Both of your cards are beautiful. I love the look of the wet on really wet first card. It would make a beautiful night sky card. The flower card is beautifully done. To be quick and easy cards they sure are stunning, I love them! I love the bold, happy colors you’ve used to paint these cards today. That blue is such a lovely background and I really like being reminded that a pretty card doesn’t need to be fussy!. The flower you painted it just beautiful! 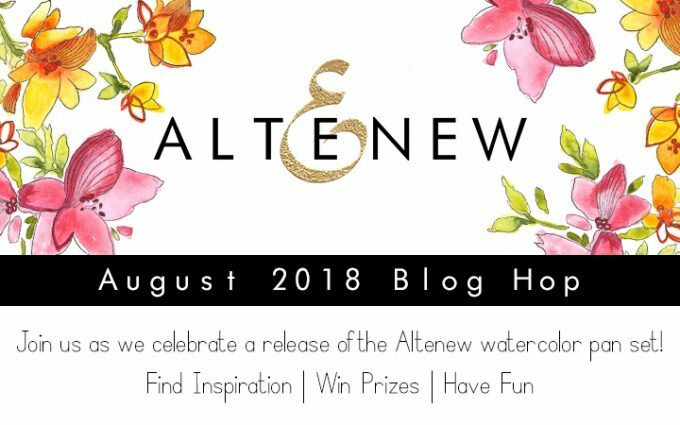 Love these Altenew colors and can’t wait to try them myself! Can’t wait to get these paints so I can try to paint cards like yours. The are fabulous. Your flower card is beautiful but I love the look of that first card. The blues are just gorgeous! These are both gorgeous Svitlana, the first one is so pretty. I love those colours and the artsy look. TFS! I love the watercolour set! The colours are so vibrant yet subtle. 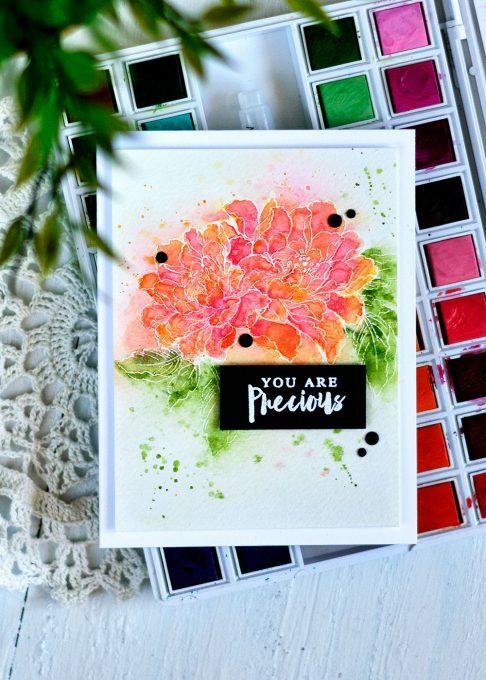 I love the card that you created Svitlana and the backgrounds look so stunning! I would definitely love to try and recreate a similar card! Thanks for the inspiration! 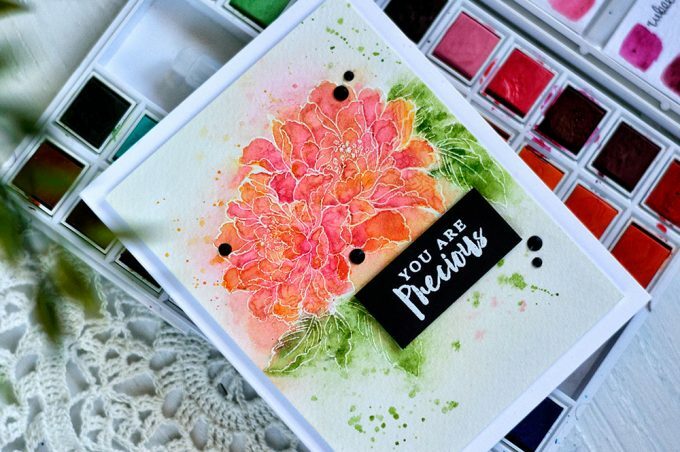 These cards are beautiful and demonstrate the watercolor set very well. The colors are vibrant and fun. I love the look of fast, messy watercolor, as long as the colors aren’t muddy. You did a great job with these 2 cards and the technique. I especially love how vibrant the colors remained after they dried!!! Both of your cards are so pretty! I love the loose, free-flowing look of the paints, especially in your first card. I’d love to see a video of how you did this. your cards are super pretty- i can’t wait to get these watercolors! I need these! Then maybe I could make cards like yours! Very nice job! Thank you for sharing!! The cards may be quick to make but they look absolutely awesome. So sweet, Svitlana. Love the “very wet” technique! Thanks for sharing these 2 pretty cards, the floral one is so pretty! I think your cards are beautiful; I just love all that rich, luscious color! Both of these cards are gorgeous. I love the styles and the color combinations. I love the backgrounds on these cards! Beautiful watercoloring! 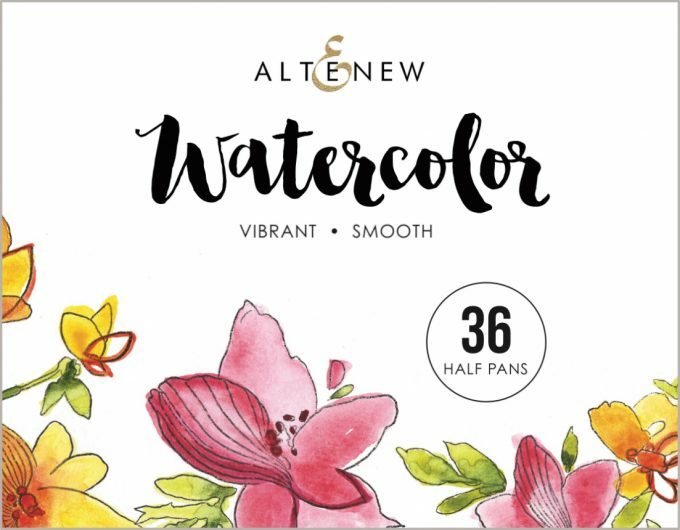 I love watercolors and am so excited Altenew has come out with a set, and the accessories! Both of your cards are spectacular. Love your artsy cards that don’t require to much skill to achieve a beautiful result. Thanks for sharing your creativity. I love that your cards are fun and simple, since I am not very experienced with watercolor. Thank you for sharing! Your cards are both beautiful! I can’t wait to see the video. Love your all blue panel! It’s so pretty!!! Your cards are stunning! Your techniques and color combinations are so beautiful. Thank you for sharing your talent and inspiring us to try water colors. 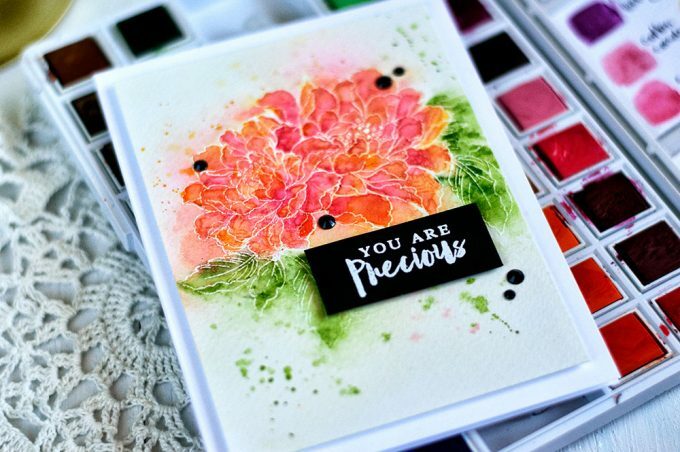 I’ve got so many Altenew stamps & dies that I would love to use to practice water color technique. Can’t wait! Beautiful cards, especially the blue one! Thank you for sharing your techniques with watercolors, both your cards are amazing! I love the “flowy” look of your first card, I really have to try it! These new Altenew watercolors look awesome! If I win this giveaway, I’ll certainly buy them! Svitlana I knew that your cards were going to be gorgeous, you are an inspiration! 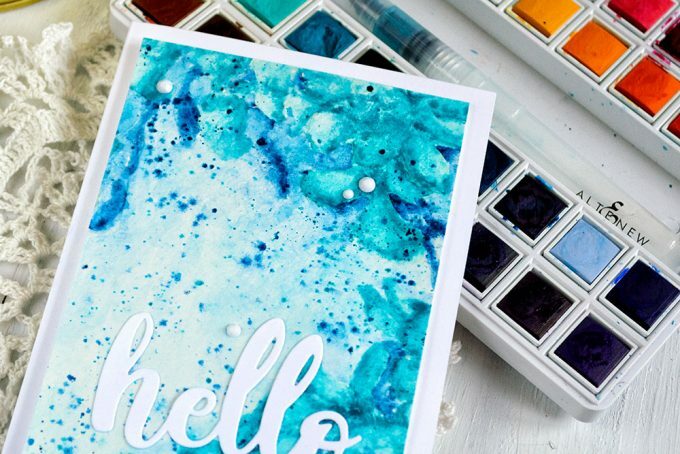 Beautiful and creative watercoloured cards…love it. Wow!! Absolutely Gorgeous cards! The blue one is so beautiful. Thanks for the inspiration. Wonderful cards! I’m especially loving the background on the blue card, it’s really quite mesmerizing! 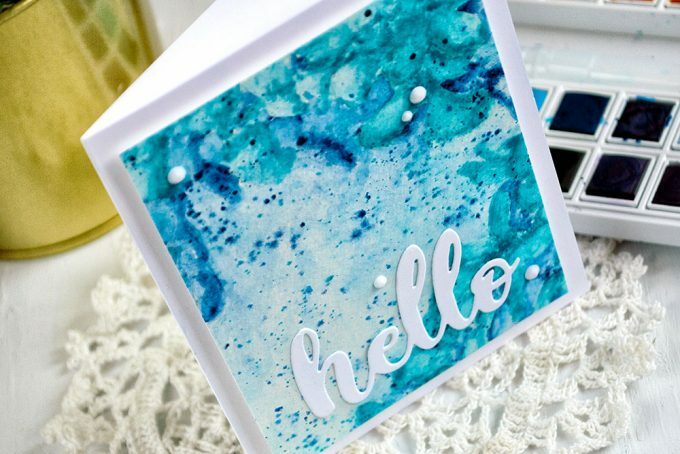 Amazing projects…love the blue background on the 1st card…stunning! Hi Svitlana! Wowza! Wowza! Your two cards are lovely! They are both arty and ethereal 🙂 Thanks so much for sharing!!! What gorgeous cards! Love the bright, beautiful colors! Absolutely gorgeous cards! Can’t wait to try these pretty watercolors! These are so beautiful and bright with lots of depth to them. Stunning cards. Thank you. I love your cards they are just fabulous everyone of them. The clarity for your put up is just spectacular and that i could think you are an expert on this subject.